Angela Casey joined LALIVE in 2017. Her main area of practice is international arbitration, both commercial and investor-state, involving a variety of sectors. 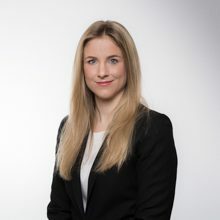 Before joining LALIVE, Angela Casey completed her legal training with Pestalozzi Attorneys at Law in Zurich and Geneva and at the Civil Court of the Canton Basel-Stadt. She was also an intern in the international arbitration group of Wilmer Cutler Pickering Hale and Dorr LLP in London. Angela Casey studied law at the Universities of Basel and Zurich (Bachelor 2011, Master 2012). From 2012 to 2014, she worked as a research and teaching assistant at the University of Basel, where she obtained her PhD in 2015. Her doctoral thesis, which explores the topic of employment law disputes in arbitration, was published in 2016.